Wes Anderson's Moonrise Kingdom has been announced as the opening film of the 65th Festival de Cannes. The announcement wasn't by Cannes festival staff, but rather an early posting by France's edition of Premiere magazine that may have been mistakenly posted in advance of the official announcement. The film is set in 1960s New England and the all-star cast includes Bruce Willis, Edward Norton, Bill Murray, Frances McDormand, Tilda Swinton, Jason Schwartzman, Bob Balaban and Harvey Keitel. The IMDb plot summary states describes it as follows: "Set on an island off the coast of New England in the 1960s, as a young boy and girl fall in love they are moved to run away together. Various factions of the town mobilize to search for them and the town is turned upside down -- which might not be such a bad thing." Cannes is scheduled to begin on May 16, the same day Moonrise Kingdom will open throughout France. The film is set to open on May 25th in North America. MOONRISE KINGDOM, the new film by American Wes Anderson, will open the 65th Festival de Cannes on Wednesday, 16 May in the Grand théâtre Lumière of the Palais des Festivals, with the Jury presided over by Italian filmmaker Nanni Moretti in attendance. 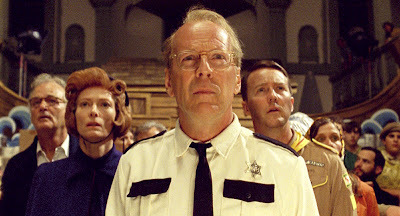 Produced by Wes Anderson, Scott Rudin, Steven Rales and Jeremy Dawson for Focus Features and Indian Paintbrush, MOONRISE KINGDOM includes in its cast Edward Norton, Bruce Willis, Bill Murray, Frances McDormand, Tilda Swinton and Jason Schwartzman as well as Kara Hayward and Jared Gilman playing the pre-adolescents. It is directed by Wes Anderson, who also co-authored the screenplay with Roman Coppola. The sound track was composed by Alexandre Desplat. MOONRISE KINGDOM was filmed on an island in New England. It recounts a tormented and surprising story of children and adults during the stormy days of the summer of 1965. Born in 1969, Wes Anderson is the director of Bottle Rocket (1996), Rushmore (1998), The Royal Tenenbaums (2001), The Life Aquatic with Steve Zissou (2004), The Darjeeling Limited (2007), and Fantastic Mr. Fox (2009). Distributed in France by Studio Canal, the film will be released in cinemas on 16 May, the same day as its screening in Cannes. For the second consecutive year, with the agreement of its partner Canal+ and the support of the Fédération Nationale des Cinémas Français, the Festival de Cannes will make the Opening Ceremony available to all the cinemas that request it, so that spectators can experience “live” the full programme of the opening night of the Festival. In the USA, the film will be released on 25 May. The official selection (Competition, Un Certain regard, Out of Competition) will be announced on Thursday, 19 April. The 65th Festival de Cannes will run from Wednesday 16 May to Sunday 27 May 2012.